Hyperikon proudly presents its premium line of LED T8 bulbs setting the standard for excellence in the world of LED lighting. Our T8 LEDs come in a wide array of color-, size- and compatibility variations and we constantly seek to improve and develop state-of-the-art LED bulbs and tubes in order to exceed our customers' expectations. ✔ SAVE 52% INSTANTLY - Save 52% on your electricity bill! 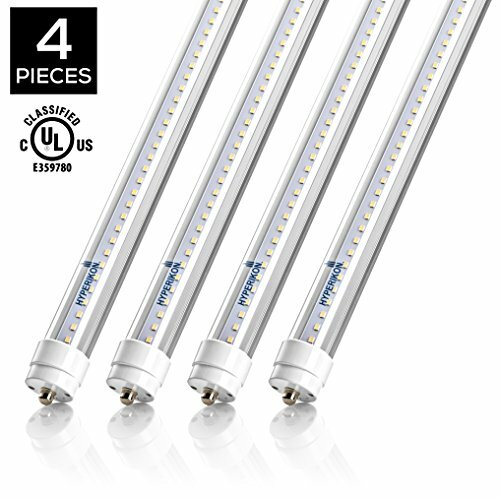 Replace 75W fluorescent tubes with 36W LED. ✔ 45,000 HOUR LIFETIME - With an astonishing life rating of 45,000 hours, or 21 years with 6 hrs/day of use, replacing your tubes is now a thing of the past. ✔ TOMBSTONES INCLUDED - To make converting your fixture as easy as possible, every order of our 8ft tubes ship with one complimentary pair of male/female tombstones per tube. ✔ BYPASS INSTALLATION - Scroll down to find the spec sheet and installation guide for more details on these T8 8ft LED single-end powered light tubes. A simple ballast bypass is required to install these tubes. Free LED tombstones make it even easier! ✔ HASSLE-FREE WARRANTY - Hyperikon's five-year unlimited warranty means we've got you covered! Contact us for an easy and fast replacement.